A Risaldar in the 19th Lancers (Fane's Horse) who was born in the village of Dhudial in the district of Jalandhar, East Punjab. He saw service in France, Singapore and China and survived the Great War. His life has been researched by his great-great granddaughter, Jane Kaur Gill. Didan Singh, son of Partap Singh, was born in the 1870s in the village of Dhudial. On 30 August 1899 he joined the 19th Lancers (Fane’s Horse). Family tradition asserts that in a military career stretching over 20 years, he saw service in France, Singapore and China. Didan Singh married Chand Kaur before the Great War broke out. Family tradition says that Didan Singh served in France between 1915-1917. In that period, official records show he was promoted to the junior rank of Jemadar on 19 May 1916. During the war, the 19th Lancers participated in the Battles of the Somme in 1916 and Cambrai in 1917. In 1918, it moved to Egypt joining the 13th Cavalry Brigade and took part in General Allenby's brilliant campaign in Palestine. The regiment fought in the Battle of Megiddo and the subsequent dash towards Damascus - riding a remarkable 550 miles in 38 days. On 8 May 1918, Didan Singh was promoted again, this time to the more senior rank of Ressaidar (see Indian Army List, January 1919, vol 2, p 912). Didan Singh was awarded an Indian Distinguished Service Medal (IDSM) for his bravery in Egypt (vide 3154/1919). The IDSM was a military decoration awarded by the British Empire to Indian citizens serving in the Indian armed forces and police. When it was instituted in 1907 it was the second highest award available to Indians, behind the Indian Order of Merit. However, when eligibility for the Victoria Cross was extended to cover all Commonwealth subjects in 1911, the IDSM became third highest in the order of precedence. 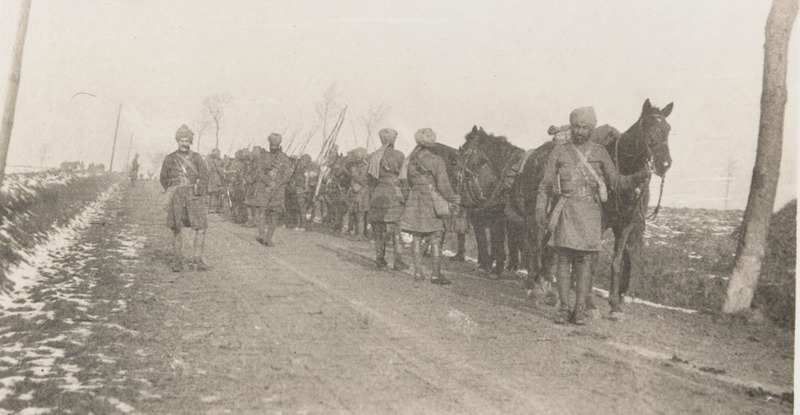 According to a pamphlet on the family's history written by Didan Singh's son, he along with a small contingent of Sikh soldiers was sent to England shortly after Armistice was proclaimed to represent the Indian Army. On 28 November 1918, they met with King George V. The next day they travelled to Hampton Court where they met one of Maharaja Duleep Singh’s daughters, Princess Sophia (1876-1948). Sophia was pleased to see those three Sikh soldiers but she also lamented her own situation and cried a great deal (see 'The History of the Hundal Community and Dhurial Village', printed privately by ex-Havildar Pritam Singh, 1 July 1989). I am sending you three photos. These are not good. I think you will receive them safely. Didan Singh survived the war and is believed to have been promoted to the senior rank of Risaldar in 1920. After 22 years of service, he retired in 1921 and returned to his home. In recognition of his service, the government awarded Didan Singh a jangi inam (war honour) pension for two generations, as well as 110 acres (133 ghumaon) of land in Sind. He purchased from his own funds a further 45 acres (54 ghumaons). Didan Singh passed away on 8 June 1933. He was thought to have been around the age of 60. Following the partition of Punjab in 1947, Didan Singh's widow, Chand Kaur, and their children left their new home (which fell within Pakistan) and resettled in East Punjab, India. They took what belongings they could carry (including the images above). Didan Singh's service rifle, which he had used during the war, was later auctioned to pay for food and shelter. In exchange for the land left behind in Pakistan, the government did a land swap in which Didan Singh's family was given land in village Rahon, District Jalandhar, which was home to many veteran families. Didan Singh's land was inherited by his two sons, Havildar Pritam Singh and Gian Singh (with the latter also receiving the second generation part of the war award pension). Gian Singh's son (Jane Kaur Gill’s father) inherited his share of the land and continues to farm it. Didan Singh's family surname is Hundal. His widow, Chand Kaur, died 18-19 December 1971. During Jane’s last trip to Punjab, India she came across the photos of her great-grandfather at a relative’s home. Jane was fascinated and wanted to find out more but unfortunately the family knew very little about their ancestor's involvement in the war. Jane made copies of the photographs with a view to finding out more back home in the UK. The images of Didan Singh above were recently exhibited by Jane, along with her research findings, in an art gallery in Walsall.